Most organizations overlook an important aspect of development that often makes it many times more effective — manager engagement. They do not try to apply training. They attempt to apply it but realize no worthwhile results. They apply training and get some positive results. Managers have many of the same behavior-shaping tools to support and reinforce learning as parents and teachers do coaching and developing children. 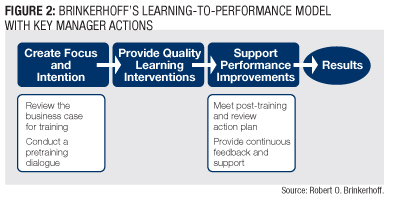 2 actions are critical to develop an application-feedback learning loop, at best only a quarter of managers perform these tasks. Vision is a coveted leadership qualities. Vision is a much sought-after trait that allows leaders to guide their organizations and creates meaning and purpose. When vision is applied strategically it translates into practical plans and meaningful work. Attaining this critical skill often comes through the use of foresight. Foresight does not mean guessing about the future. Foresight is the identification of relevant opportunities emerging and strategizing how to make the most of them today. What if we all came to agree that multi-tasking is not an ability, but a liability? That we really can only do one task at a time, ever? A trainer is in poor position trying to engage and make training stick. Ms. Cairns, and her consistently good blog, offer some thoughts for managers, for trainers, and for vehicles on how and what to do to help make training stick. Federal agencies are paying more attention to vertical transactions over anticompetitive concerns, it seems. In particular, antitrust enforcers see red flags when a merger between 2 companies along the same supply chain could possibly affect a competitor’s ability to access a key product. One way to track this increase is through so-called second requests, when the DoJ and Federal Trade Commission ask for more information about a transaction. Between October 2009 and September 2010 agencies issued 46 second requests or 4.1% of the 1,166 transactions submitted to the agencies during their 2010 fiscal year (all types of M&A deals, not just vertical ones). Between 2004 and 2008, by contrast, less than 3% of transactions received second requests. So, what do smart companies do to avoid the 4- to 8-month delays to defend their deals? One idea: companies look up and down their supply chain for possible acquisitions as a risk-management tool, not just as a way to expand the business. One of the most important figures of the 4 Asian Tiger economies give his thoughts on China, America and the immediate threat assessments. When the brilliant Charlie Rose interviews a benevolent dictator it is always an insightful read.